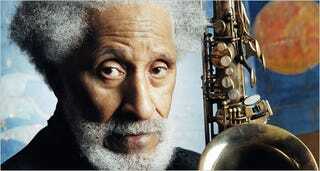 Our man Mark Jacobson has a beautiful story on Sonny Rollins in the latest issue of Men's Journal. Rollins played with the great musical innovators of the mid-century—Parker, Monk, Dizzy, Miles. When he was at the top of his game he took a two year sabbatical to practice and get better. He's 82 now and the man has kept playing long after his idols and many of peers are gone. "I think he was really lost there for a while," said the esteemed jazz critic Gary Giddins about the work Sonny did in the early to mid 1970s, an exceedingly strange time to be a jazz musician of the traditionalist bent. In what appeared to be an ill-considered attempt to keep up, Sonny made a few "fusion" records with Bob Cranshaw's electric bass, a number of jazz-rock guitarists, and the criminally forgotten kilt-wearing, bagpipe-playing Rufus Harley, but nothing took off. By the late 1970s, however, things began to look up. "Sonny seemed to relax," Giddins said. "It was as if he realized that he was primarily a concert artist and didn't have to spend all that time in the recording studio. His live solos became these great meditative, playful, stream-of-consciousness things. It was like the whole history of the music was just pouring out of him on any given night. The audience understands the process, waits for him to find his groove, then the whole place explodes, because when he's on, there's nothing else like it in this world. The fact that he has continued to play as well as he has for so long is a real blessing. I never thought I'd say this, but Sonny's really great period might be 1978 to now." "I mostly stay in," Sonny said, sitting in his leather chair with his now familiar blood-orange skullcap on his head. He had a bunch of tests scheduled to check on his lungs, which he said had gotten "a little worse." He believed that the problem had been building for some time, perhaps back to 9/11. "I was living so close to the Towers, and when they fell down, we had to stay there," he said. "It was such an upsetting time, I really felt like playing. I took out my horn and took this deep breath, something I've done a million times. But I immediately felt sick, like I'd gulped down something bad. Some poison. It was just in the air." Sonny looked wistfully at his sainted ax sitting on a brick shelf beside the fireplace. He hadn't played for months, the longest period since he returned from India in 1971. But he wasn't feeling sorry for himself. Indeed, he appeared in good spirits, even jolly. It was difficult in the beginning, he said, not being able to practice. It was something he feared. "I really felt that would be the end of me, not being able to play. But I'm coming to terms with it. We're here for such a short time, you have to make the most of it. I've been lucky, getting to spend my life playing this horn. So how can I complain?" Besides, Sonny said, it wasn't like the verdict was in for sure. There was every chance he'd play again. This was a good thing, Sonny said, because "I haven't really met my goals. I haven't made my full statement yet." He asked if I remembered what he'd said back in Germantown, about those transcendent notes, the notes that hadn't yet been blown, the ones that were going to take him "past Sonny Rollins, way past." Of course I did, I said. "Well, keep your ears open," Sonny said. "They're coming." Made me think of Linda Ronstadt who told AARP last month that she has Parkinson's. “Every time Emmy comes to town, I wish I could get up on stage with her,” Ms. Ronstadt said. “I know I’d be allowed to, but I can’t do it.” Instead she will sit in the audience “and think the notes I’d be singing” in earlier times. For more on Sonny, click here and here.